Yes, I might tweak it a bit later. There are six special tomes that you can study, and they will have their own graphics. So when I do the other books, I might adjust the Necronomicon as well. But in this game it won't bound in human flesh and have a scary face, like in the Evil Dead-series. According to Lovecraft, the Miskatonic University's copy of the Necronomicon is the latin translation, printed in Spain in the 17th century. So it's appereance is much more like an regular, very old book. But I understand you point! Looks like a nice game with some interesting features. Armitage must trust Walter an awful lot to leave him alone with the necromicon. And He could unlock the window to sneak in later. Though I imagine that when Walter's done that Armitage will put the necromicon back behind the locked door at the left side of the screen with all the other forbidden books. That's pretty close! I don't want to spoil too much, but you need to reserve a time to study the Special Collection, and Armitage gives that only if he is convinced your studies require access to the books. There's other stuff also happening in that room, but I won't go there now! And what about the other minor characters of the short story like Desrochers, Choynski, Mazurewicz & Elwood? Good question! Joe Mazurewicz is in the game, and he has a quite big role in it, as he knows a lot of the lodging house's history. Also Elwood will be in the game, but I haven't yet added him. But Elwood will also have a big part in the later part of the game, sometimes you can stay at his room, if the disturbances get too rough. But no plans for Desrochers or Choynski... Maybe they will be added in DLC! By the way, sorry for the radio silence, but been busy with other (paid) work... But looks like I can make nice progress later in summer. Good to hear, can't wait for this one. How many other places will there be for Walter to sleep? Most places at Miskatonic university would likely be closed late at night. Walter can sleep at his home, and later in game when Elwood moves in, he can stay at his place (if Elwood is around himself). But those are the only places right now where Walter can sleep. I have thought about having the possibility to sleep out in the city bench at night, if Walter is tired enough (and ofcourse all kinds of nasty things can happen then), but let's see if it ends up in the game. Not a priority! Shops, universities and other facilities are closed at night, some of them are also closed on weekends. The article is in Spanish, but if you can’t understand it, you can look at the pretty pictures it has! Hi again and sorry for the silence! The summer was a busy time for me, and the game didn't progress that much, but now it's getting better. I've started to do the ending, but I won't spoil it with screenshots. Because the game isn't strictly linear, it takes a lot of time to make it work in every scenario, but it's starting to shape up. There are some parts missing from the middle of the game too, but now you can at least play it from start to end. Anyway, here is a older screenshot from Orne's Gangway. People who have read the short story know what's going on there. It's still bit work-in-progress, there will be some more residents hanging around. Currently Walter is trying to dig up some information from a tough street kid. Nice background Rongel, so old-provincial! Obviously I need to read the story eventually. The Masters of Horror episode and rock opera haven't provided me with any information to have a clue about the new background. 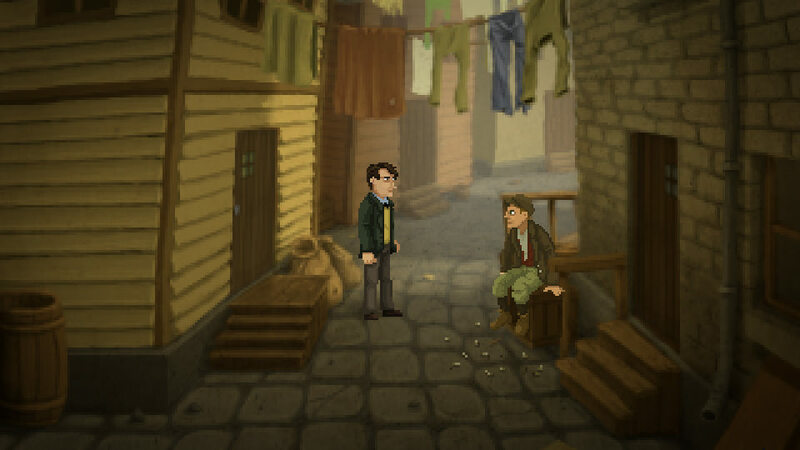 I hope you wrote the street kid's dialog in the clueless and stereotypical way that Lovecraft wrote how the kind of people he had never talked to talked! I really strived for that tone while writing the English version of Chronicle Of Innsmouth, especially with the way the Innsmouth smugglers talked as if every day in Innsmouth was "Talk Like A Pirate Day". And the voice-actors totally understood how to pull off their lines without any direction from me at all. It was almost scary how much their performances matched the voices I heard in my head while writing the lines. Thanks! It depicts poorer part of the city where the Polish immigrants live. Online image search and research really comes in handy, when imagining late 1920's Arkham. It think the location was mentioned only couple of times in the short story, but in the game it's importance is boosted a bit. Yes, the final, polished dialog is something I may need help with. Old accents and phrases are a bit difficult for a non-native English speaker. I haven't played the new version of Chronicle of Innsmouth with the voice actors, but it sounds interesting. And even more interesting is to hear about the sequel! Have you created the main sprites? I recall the witch from a while back. If you mean the main characters, then yes. I think Walter's friend Elwood is the only main character that is still missing. There should also be quite a lot of Arkham citizens and students, so that takes some time.